With the dizzying array of immune system supplements available, how do you know what to choose? Which immune system boosters have research to back their effectiveness, and which one is right for you? Look to the well-researched immune system supplements discussed here to help you stave off the flu. Do you want to stay flu-free? Are you curious about immune system supplements, wondering if any of the hundreds available are really effective? Many naturopathic and integrative doctors recommend effective, immune system boosters that can be safely taken long-term during the flu season to help lower the likelihood you’ll get the flu. Even conventional doctors agree that prevention is the most effective management strategy for the flu. The most common conventional flu prevention strategy is vaccination. A flu vaccine does not guarantee you will not get the flu, although it may make your symptoms milder if you do. Historically, Medscape reports that the flu vaccine has had 50 to 60 percent efficacy against infection with influenza A viruses and 70 percent efficacy against influenza B viruses (the two most common types of flu viruses). Is a Flu Shot Necessary? The flu vaccination effectiveness rates published by the CDC have been strongly disputed by some scientists for years. A prime example: In a British Medical Journal editorial published in May 2013, a Johns Hopkins Medical School scientist blasted the CDC for pushing flu shots, saying these federal health authorities vastly overstate the benefits of the flu shot and, for most healthy people, vaccination is unnecessary at best and potentially risky at worst. Yet there are plenty in the medical community who still insist it’s better to get a vaccination than to pass. While health experts debate flu vaccine effectiveness and safety, you might consider the idea of improving your own odds by strengthening your immune system. 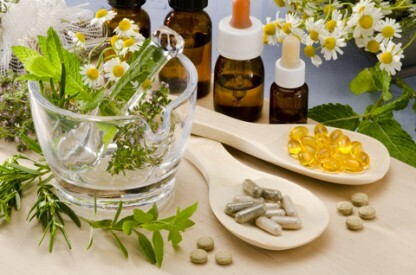 Research shows that certain natural immune-boosting remedies are safe and effective if taken prophylactically. If you’d like use natural medicine to help stay healthy and flu-free (either in addition to or in place of the flu vaccine) you’re in luck. Below is a brief discussion of some of the best-researched herbal and nutritional therapies that have been shown to reduce the likelihood of getting the flu or a viral upper respiratory infection during the flu season. Eat a good diet, which means cutting out or vastly reducing sugar and getting plenty of whole, unrefined foods, including whole grains, fruits, vegetables and adequate protein. Take a high-quality multivitamin and mineral supplement on an ongoing basis. Live a balanced life that does not include too much stress (this includes getting adequate sleep). The following natural immune system supplements can be used long-term during the flu season to help prevent the flu. Black elderberries are known to be extremely rich sources of plant compounds called polyphenols, including ﬂavonoids, catechins, and proanthocyanidins, as well as possessing a variety of anti-oxidant properties and enhancing the immune response. In addition, elderberry extracts have shown to help ward off the flu and other respiratory viruses in human clinical trials. For flu prevention, take a spoonful of delicious elderberry syrup (such as Sambucol) twice a day. Higher doses of elderberry syrup have also been found to reduce the severity and duration of the flu. Perhaps the most recognized herbal supplement today for prevention and treatment of colds and flu, Echinacea has come under much scientific scrutiny to determine its effectiveness and the studies have yielded mixed results, depending, in part, on the type, concentration, and dose of Echinacea extract used. One well-researched Echinacea extract that has proven to help protect individuals against catching colds and flu is a Swiss extract of the fresh roots and aerial parts of organically grown Echinacea purpurea and is called Echinaforce. Echinaforce is commonly sold in the U.S. as tablets or liquid. Take as directed on the bottle. Numerous studies have shown taking either American Ginseng (botanical name: Panaxquinquefolius) or Korean Red Ginseng (also known as Panax ginseng) during the flu season lowers the risk of contracting a cold or the flu. Dosages used in studies have varied depending, in part, on whether the ginseng supplement contained an extract or the whole dried herb and whether it was a liquid, capsule, or tablet. If you’re commonly run-down, stressed, and fatigued, Panax ginseng may be the best option for you as a preventative during the flu season, since this ginseng is also an excellent adaptogen that treats stress-related fatigue. Take as directed on the bottle. Elderberry, Echinacea, Beta-Glucans, and Red Korean or American Ginseng are just a few of the well-researched immune system supplements that you can safely take throughout the flu season to decrease the chances you’ll get the flu. Beta-glucans, such as those found in the patented supplement Epicor, are another favorite immune system supplement for flu season prevention. Have you tried these or other immune system supplements to help you prevent and treat symptoms of the flu? If so, tell your fellow readers in the Comments section below what supplements and herbs have worked best for you. Influenza, Medscape, September 16, 2013. Wien Med Wochenschr. 2013 Feb;163(3-4):102-5. J Korean Med Sci. 2012 December; 27(12): 1472–1478. adequate sleep, diet, echinacea, elderberry, fatigued, flu, Flu shot, ginseng, health, how long does the flu last, immune system, infection, integrative, natural medicine, natural remedies, naturopathic, nutritional supplements, panax ginseng, polyphenols, protein, sleep, stay healthy, stress, sugar, supplement, supplements, symptoms of the flu, vegetables, virus, whole grains. Average cruising altitudes (your avg. 8000 ft.) is a moot point, since commercial passenger airplanes are pressurized from ground level to right at 5000 feet plus or minus a very few feet. Great article, thank you.